The SCARPA bestseller gets a new look and comes back with a sleek design and new trendy Black / pagoda Blue colors. The F1 touring ski boot has established itself as a model of reference for its practicality but also for its versatility. The Carbon Core Technology brings support and lateral stiffness while the EVO Tongue takes over the Axial Alpine Technology for a better tibial support and support high enough to find sensations close to an alpine ski boot. Its rear lever system ensures a very easy skiing / walking mode. The Scarpa F1 touring ski boot has been designed to be simple to use, its BOA system allows a very precise shoe adjustment and the 2 straps allow a very easy clamping of the collar with or without gloves. The new strap of the collar integrates a RECCO research system , a 100% reliable technology, more and more used by mountain rescue. The BOA® system offers a custom closure and fits for comfort without pressure points. Each click equals 1mm of precision adjustment. 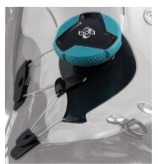 Once adjusted and locked in place, the BOA® system continues to lock securely, even after several hours of use. Thanks to RECCO® technology, rescue teams can follow you in the event of an avalanche. The technology includes RECCO® reflectors attached to clothing, helmets, guards and boots, and RECCO® detectors used by more than 800 rescue organizations around the world. Reflectors and detectors allow users to track missing persons through the use of harmonic radar technology. RECCO® technology is an additional tool that can be used with avalanche transceivers, probes and rescue dogs. Technology allows rescue organizations to find buried or lost people faster and increase their chances of survival. 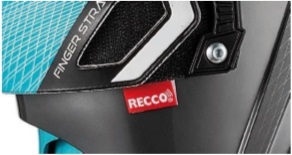 On F1 models, the RECCO® reflector is installed in the FBC strap of the right boot.